Frankly, I wouldn't mind escaping to Bolivia myself, especially from about April through September when the eared doves swarm and devastate the ripening sunflower fields and other small grain crops. From Santa Cruz to the east, the terrain flattens out from the rugged Andes to the west - into a vast plain that covers thousands and thousands of square miles. Some of this land is still in tall timber, while there's also plenty of brush, but several decades back Mennonites moved in, started clearing land and planting crops. By and large these farmers have been very successful. Interestingly, the government in Bolivia has some strict regulations about clearing land. Wide, wide fencerows must be left between each new field, plus the trees can never be cut in those fencerows. Since decades have passed many of these fields are bordered by very high, mature trees. 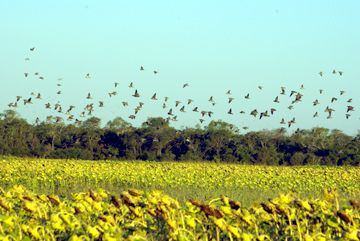 When the doves fly in to feed in such fields they come in very high, over the big trees, providing some of the world's most challenging dove shooting. I shot in Bolivia for just the second time last July, and I found out plenty about taking such high, incoming doves. Despite their speed, there is time, so it's important not to rush things. Also if you see a bird you want to shoot but you can't get moving in time, not to worry, another dove will be right behind, or perhaps a whole passel of them, and probably within seconds. But here are some keys to successfully making this shot. Train yourself to look at the high incoming dove's beak or head, and never take your eyes off that little target. As the day and days wear on, as long as you work hard at concentrating on the dove's head or beak, you'll become more and more adept at seeing that small area more and more clearly. Of course, you must never look at the gun barrel or rib as you are making your move to shoot, and there's certainly a tendency for most of us to do that. While making your hard stare at the bird, your gun's muzzle should be just below that target. Start your gun mount. Let me diverse for a bit and suggest that one of the most important keys to consistent shotgunning is a consistent gun mount. You can bet Kobe Bryant practices shooting baskets every day of his life. Shotgunners should do the same - practice their gun mount every day of your life. Perhaps in some future essay in these pages we will tackle some gun-mounting suggestions. Now let's go back to starting that gun mount. Since the dove is flying toward us we can take the bird as it comes straight in - or we can take it to one side or the other - depending upon what flight path the dove decides upon. Whichever - the gun's muzzle comes smoothly to the bird, and we want to take our shot in front, not wait until the bird has passed overhead or beyond to one side or the other. Regardless of the route the bird takes, the idea is to put the gun's muzzle on the bird and track though perhaps only briefly. Once the muzzle is moving at the same speed as our quarry we have the shot perfectly set up. Now simply pull away and pull the trigger. Don't, however, jerk the muzzle out in front. Simply make a smooth move forward of the bird and pull. As long as the range isn't great you will not have to pull too far in front. Obviously, at greater ranges, like 50 and 60 yards, the pull away must be farther. Finally, stay in the gun until you see the dove fold. At say a 35 yard shot the bird's folding will be almost immediate, but with the pull away method I've suggested for this incoming shot staying with the gun is very important. That's because this forward movement of the gun, the pull away, is what kills your dove. You can shoot a dove that's coming directly in toward you as I've suggested, or a bird that's coming in and slightly to your right or left. If the range is farther - 40, 45, 50 yards, etc. this technique works equally as well. Remember the keys; (1) lock your stare on the dove's beak, (2) the gun's muzzle should be initially positioned just below the bird's flight path, (3) start your gun mount and stay smooth - no jerking, (4) match muzzle speed with the target speed, (5) make a smooth and gentle pull away, (6) stay in the gun until the dove comes twirling down. Jorge Molina owns Las Palomas Lodge in Bolivia, and he taught me this technique. Whatever shot you want to work on - the doves of Bolivia are certain to cooperate, and there will be someone at the lodge who can help you. The lodge, rooms, food and guides are all excellent. They will be glad to send you a video before your trip that will have you salivating with all the shotgunning action that's available there. Trek Safaris near Jacksonville, Florida is their booking agent. Contact Ron Stafford at Trek - (800) 654-9915.